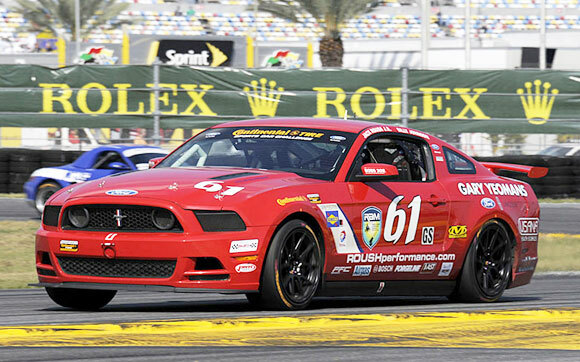 The Grand Am Continental Tire Sports Car Challenge season is under way with Jack Roush Jr and Billy Johnson getting their second win at the famed Daytona International Speedway. “It’s really great to win to win at Daytona two years in a row,” Roush said. The #61 was running comfortably in the top-5 while under green, until Jack Roush Jr. gave up the spot under yellow-flag conditions when the car’s left-front tire lost its pressure. The Mustang was then handed over to Billy Johnson to take the car to the front which he did for the final 70 minutes to hold off the 68 car field for the win. He finished 1.812 seconds ahead of 2012 GS driver champion in the #15 Multimatic Motorsports Aston Martin Vantage. The Aston swapped the lead with Johnson just after the halfway mark, but a small bobble on their team’s final pit stop gave the Johnson/Roush a little extra for the win. The #51 ROUSH Performance had clawed its way through the pack’s front after starting dead last, first-shift driver Joey Atterbury was running fourth when transmission problems brought the car into the pits midway through the race before closer Shelby Blackstock even had a chance to climb in. The No. 61 Mustang is sponsored by ROUSH Performance, Gary Yeomans Ford Lincoln, Kooks Custom Headers, PWR, BMRS, GoPro, USANA and Mechanix Wear. The No. 51 Mustang is sponsored by Starstruck. The No. 49 Mustang is sponsored by Micasa Ford. I won’t watch Top Gear because of those pompous British jag offs! !